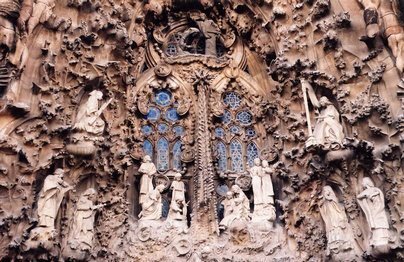 We offer you a collection of wonderful pictures of the Sagrada Familia Church in Spanish, meaning La Sagrada Família or Holy Family Church. Is a Catholic church, one of the largest churches built in the European continent, located in Barcelona, ​​Spain. Laying the foundation stone for its construction in 1882 and the project continues to this day. In 2007, it was selected as one of the twelve treasures of Spain. Sagrada Familia Designed by the world architect Antoni Gaudi (1852-1926) and dedicated nearly 15 years of his life to its construction. But the Spanish civil war of 1936 caused the destruction of some of its parts during the war, and after the country stabilized, work continued on the construction of the church. The Sagrada Familia church is now one of the most popular places for tourists in Barcelona, ​​who can visit the completed parts, where more than a million tourists visit annually. It is believed that the construction work will be completed in 2026. I will leave you with this charming picture, I hope you get your admiration.